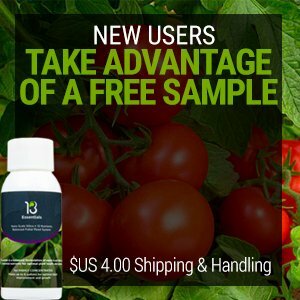 13Essentials is a balanced formulation of nano-scale silica plus 12 other nutrients to maximize results of plants grown in soil. Compatible with all fertilizer programs, 13Essentials is a highly concentrated formula that gives plants everything needed to remain healthy throughout the growth cycle. 13Essentials is a balanced, nanoscale liquid foliar spray fertilizer specially designed to increase the overall growth and health of your indoor and outdoor plants. The unique formula contains Silica as well as 12 other nutrients to maximize results yielded by indoor/outdoor plants grown in soil, hydroponically or in an alternate media such as coco. 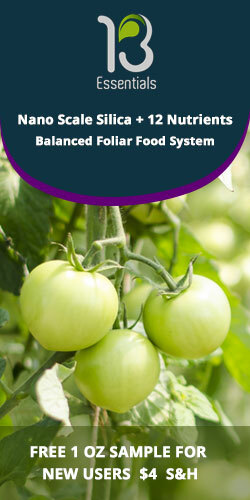 13Essentials foliar spray fertilizer is a safe, non-toxic formula that is derived from naturally occurring minerals, and can be used as a seed treatment in addition to its primary function as a foliar fertilizing spray. You will see the difference in quality, size and health of your plants in no time when you begin using 13Essentials foliar spray fertilizer. Hobbyists and professional growers alike are amazed by the results they see when they add the high-quality foliar spray fertilizer, 13Essentials to their grow procedures. Iron is a constituent of several enzymes and some pigments, and assists in nitrate and sulfate reduction and energy production within the plant. Iron is what gives the plant oxygen therefore resulting in the healthy green color. Think of calcium as the glue holding the cell walls of plants together. Without sufficient calcium, growth of new plant tissue can become distorted due to improperly-formed cell walls. Boron is used with calcium in cell wall synthesis and is essential for cell division (creating new plant cells). A building block in the photosynthesis process, magnesium is essential for producing clorophyll. It is impossible to have a high crop yield without zinc. Only required in small amounts, zinc is an essential for plant growth. Though its primary function is as a part of enzyme systems in plants, manganese is also directly involved in the process of photosynthesis, and accelerates germination and maturity of plants. A fundamental component of vitamin B12 as well as Propionate, which is one of the main sources of energy for continued plant growth, cobalt is necessary for production of sufficient B12 for plant cell division. Without molybdenum, a trace element found in soil, the enzyme nitrate reductase would not be able to properly be synthesized. Silica, when made available to a plant, the plant will store the silica in its cell wall as well as internally in the cell. Plants grown with silica grow thicker cell walls, which results in stronger stems, it helps protect plants from fungal and insect attacks. Silica also affects the plants ability to absorb and translocate macro and micronutrients and toughens the plants resistance to drought and nutrient imbalance. Helping plants convert other nutrients into usable building blocks with which to grow, Phosphorus is one of the main three nutrients most commonly found in fertilizers. It regulates protein synthesis and is important in cell division and development of new tissue. Commonly known as the quality nutrient, Potassium is considered second only to nitrogen when it comes to nutrients needed by plants. 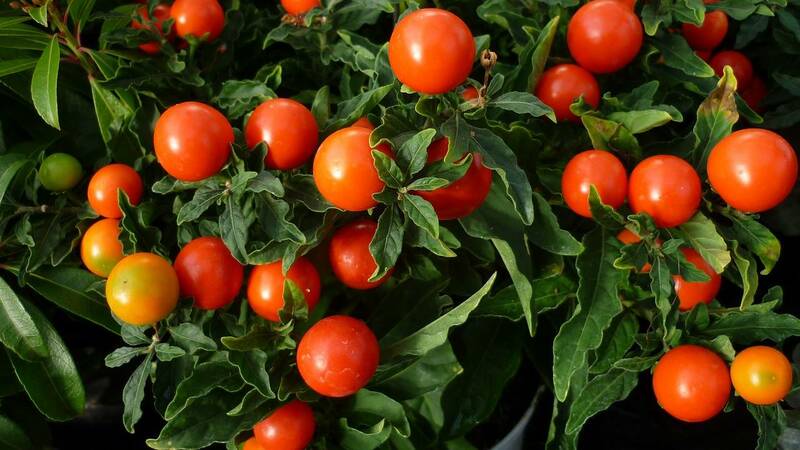 It will help regulate plant metabolism and affects water pressure regulation inside and outside the plants cell. Particularly good for root development. "It works better than my regular foliar application concentrate on my hops plants. In all, I enjoy the product I have received, and definitely plan on buying more." "There is a fern in my yard that has looked anemic for the last 12 years. This winter I got a sample of 13Essentials…the results speak for themselves!" " After four weeks of feeding my seedlings once a week, I can already see a huge difference in the health and size… loving this so far!!! Thank you 13Essentials!!! " 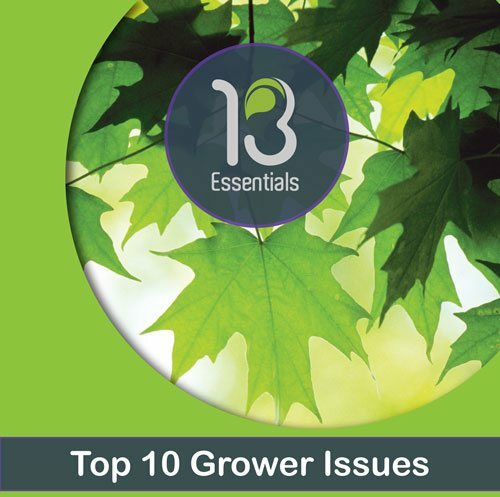 Download Our Top Ten Grower Issues Guide Today!